Thirteenth Session of the 16th Lok Sabha was held from 15th Dec 2017 to 5th Jan 2018. This Session had 13 sittings. The performance at a glance is given in this graphics. 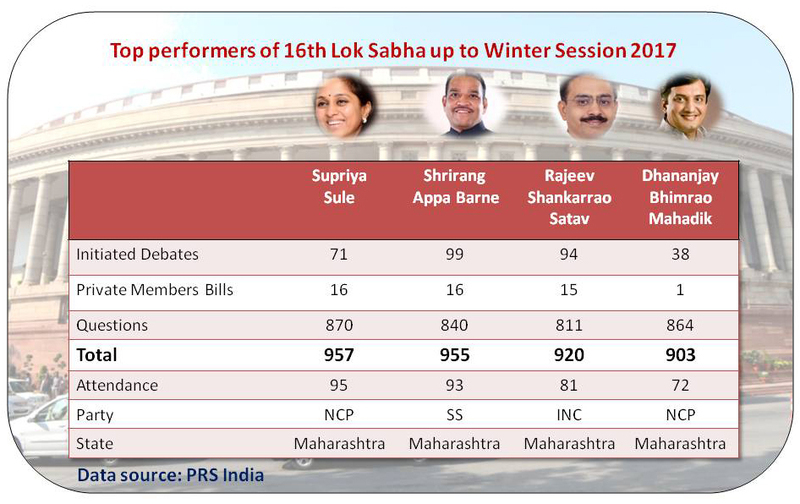 During the session, Lok Sabha worked for 78% of its scheduled time, while Rajya Sabha worked for 54%. So far in the 16th Lok Sabha, the average productivity of Lok Sabha is 92% and that of Rajya Sabha is 73%. ▪ Time was lost due to disruptions regarding certain statements made during the recent state elections, and the protests related to the Bhima Koregaon issue. 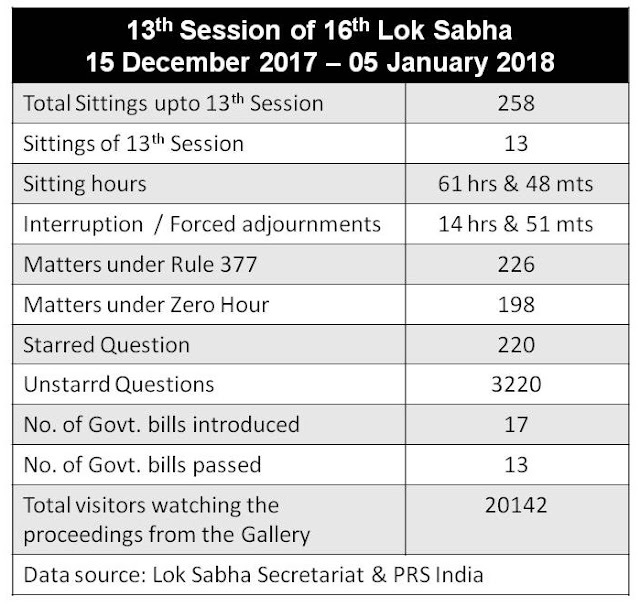 Out of 13 sittings, Lok Sabha sat beyond its scheduled time on six days (approximately eight hours). On the other hand, Rajya Sabha sat beyond its scheduled time on two days. 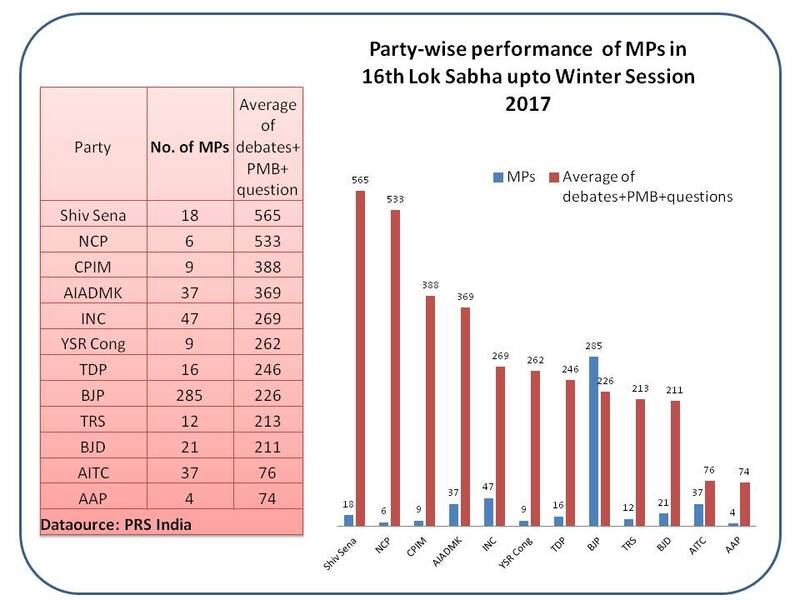 In this session, both the Lok Sabha (48%) and Rajya Sabha (42%) spent the largest share of their time on legislative business. 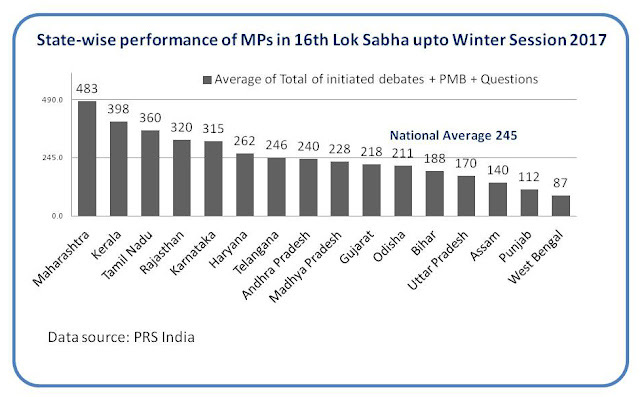 This was the highest recorded in the 16th Lok Sabha. Both the Houses also recorded one of the lowest share of time spent debating other issues of public importance. Since 2014, Rajya Sabha has spent more time debating issues other than Bills. However, in this Winter Session, this trend was reversed where the time on legislative business exceeded other debates. 17 Bills were introduced in this Session and 13 were passed. AT the end of 13th Session, 67 Bills are still pending before the Parliament. 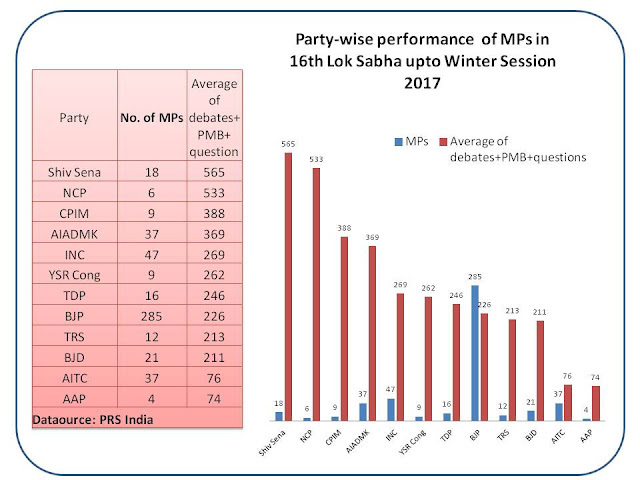 This chart indicates the performance of Top 4 MPs of Lok Sabha, based on the debates initiated, private members bills and questions. PreSense Congratulates the Top Performers. It is a cumulative achievement for all the 13 Sessions of 16th Lok Sabha. 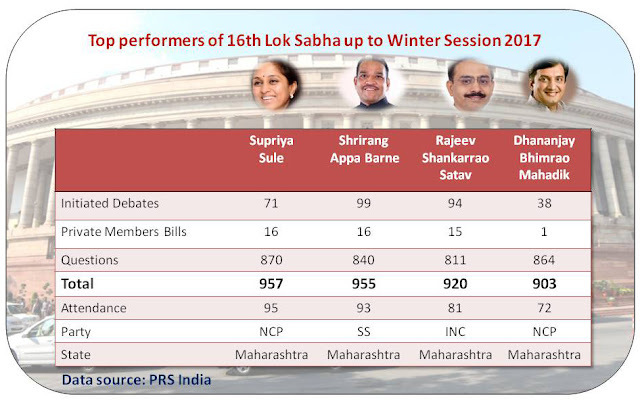 Interestingly, all the top four performers hail from Maharashtra State. Among the major political parties, Shiv Sena and Nationalist Congress Party (NCP) have topped the performance till the end of 13th Session. All India Trinamool Congress (AITC) and Aam Aadmi (AAP) Party have shown poor performance. (Small parties are not taken into account for analysis). Maharashtra has done extremely well followed by Kerala and Tamil Nadu. West Bengal has done poorly. (Small States and UTs not taken for analysis. Only major states are analysed). PreSense congratulates all the individual top performers, top performing Parties and the States. The Fourteenth Session (Budget Session 2018) will commence on 29th January 2018. Our Sansad Ratna Awards, instituted by the eMagazine PreSense and Prime Point Foundation will be based on the performance upto the end of second party of the Budget Session with more additional parameters. 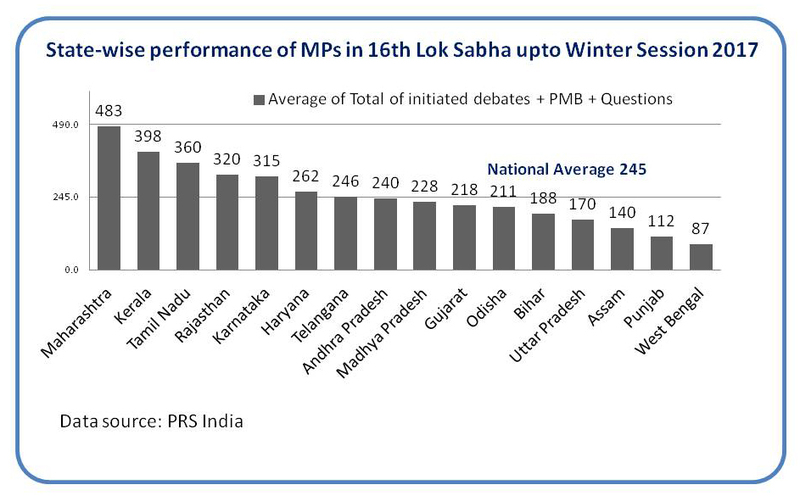 Data source: Lok Sabha Secretariat and PRS India.